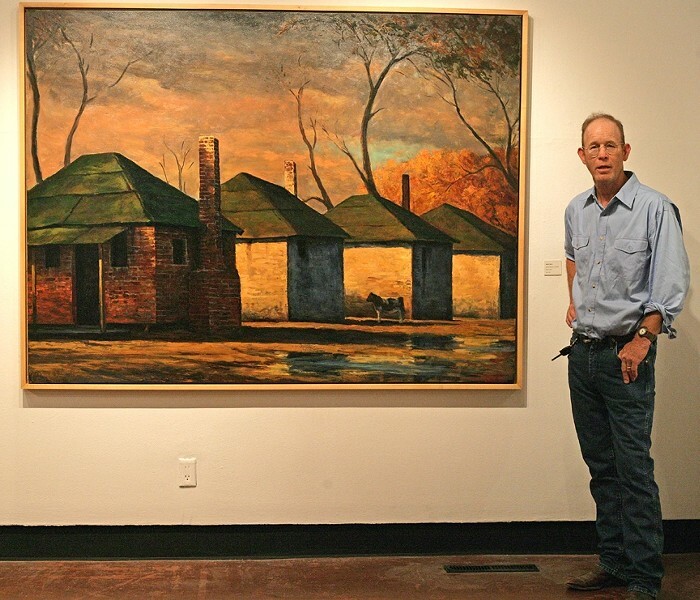 MEET THE ARTIST : Former SLO Resident Mark Beck stands by his painting Slave Quarters (Chattel), part of a new collection of paintings hanging through July in the SLOMA. Mark Beck is a lanky, bespectacled man, who—a couple of decades ago—was a recognizable fixture of downtown SLO and considered one of the area’s finest artists. Originally from New Mexico, he returned there years ago, and his reputation as a fine artist has continued to grow. This month, his work is showing at the SLOMA. New Times Your work is often compared to Edward Hopper. In what way do you see similarities or differences? Mark Beck Hopper has been a strong influence all the way around. He’s taught me a lot. The best way to learn is to study another artist’s techniques and go from there. I’ve moved on from Hopper as you will see in the show. But he has been a great teacher to me. The similarities are iconic images where he found and expressed the essence of things. Now I’m heavily influenced by Vincent Desiderio, Alex Colville, John Currin, etc. and spend much more time trying to learn what I can from what I like about their work. COME TO THE OPENING! : The San Luis Obispo Museum of Art presents “Tyranny of Beauty,” a collection of works by former SLO Resident Mark Beck, opening Friday, July 5, with an artist’s reception from 6 to 9 p.m.
New Times You’ve been painting images of houses for years, and I recall an earlier conversation we had long ago in which you explained how some of the house paintings were metaphors for human relationships. Do you still think about and employ this idea? Mark Beck As far as houses go, I use their symbolism freely and frequently. The new painting Hole in the Sky is a gutted house, symbolic of people half there, communities being ripped apart. The current economic, environmental, and political situation is really conveyed in this newest body of work for the museum. New Times You’ve been a full-time professional fine artist for more than 20 years now. I’m sure some budding artists would love to know your secret of success. Got any advice for them? Mark Beck Secret of success? Sometimes I think my biggest accomplishment is selling enough work to avoid having to do something I don’t want to do all day. I have many extremely talented artist friends in New Mexico who are simultaneously framing houses or part-time teaching and whatnot just to make ends meet. Being an artist now in this economy is highly competitive and not very lucrative unless you’re someone like Damien Hirst or John Currin. Still, I admire the perseverance we artists show—to not let such things as “earning a living” get in our way when we want to express ourselves! New Times You’ve had dozens of solo shows, some as far away as Japan; your paintings have appeared on TV in the HBO show In Treatment; your work has appeared in magazines and journals; you’ve won juried painting competitions, but what’s your proudest professional achievement? Mark Beck I’ve always wanted to spend my life painting and started out young. When and if my young daughter wishes to paint, I will encourage her and—better yet—give her great business advice, because when it’s all said and done, it’s nice to spend your time painting and earning money, but this is precisely what makes it a business and you need to get your business hat on once you get out of the studio. I’m lucky because [my wife] Carmela does so much of that for me, and there’s a lot (website, e-mails, etc). As for advice to others, I would say start forming strong relationships with other artists who can inspire you and critique your work. I have a solid handful of good artists whom I get together with and learn from. We help each other out and support each other with thoughtful input and encouragement. Also, finding a gallery that is aligned to your vision, that has a good reputation for excellent customer service and a collection of other artists whom you admire, is one of the most beneficial things you can do. I’ve had my three dealers for years now (The Vault Gallery in Cambria for at least 10), and your dealer is your best representative of your work to the outside world while you focus on getting better as an artist—you can’t do it all, so trust your dealers and expect them to take over the marketing. I know it’s very difficult to get in a gallery these days, so start local and have a good website. I remember very well trading coffee and food at Linnaea’s for a painting, showing my work at Burris Saddlery, and I’ve heard of other artists recently who have done similar things that led to someone in the art world noticing them and giving them a step up. It is humbling to be sure, but in my case, there is nothing I was willing to do but paint, so I had to make it work.